Life, Laughter and Paris: 2012 - I'm Not Done With You Yet! 2012 - I'm Not Done With You Yet! but I didn’t. I didn’t understand this was a warning, a hint, a great big fat neon-signed omen of things to come. Not awful things mind you, just not good things. I know we should all count our blessings. I’m grateful I didn’t get malaria or beriberi. It’s great we didn’t starve, go deaf or get our hands caught in a snow plow. We’re happy the raccoons stayed outside, the car didn’t blow up and aliens didn’t experiment on our brains while we were sleeping (not that we know of anyway). But that’s where it ends! (You note I’m not going near the world situation – who knew the entire planet would all of a sudden go crazy)? (Not all at once of course). Cabbage leaves are considered a sign of prosperity, being representative of paper currency. In some regions, rice is a lucky food that is eaten on New Year's Day. I’m not big on cabbage but I have no problem having it in the house. Rice is good……we’ll have some. With optimism and superstition combined, I’m feeling good. 2012 – I’m giving you one more chance! I’ll be buying a lottery ticket on the way home and if I win, I’ll stop bad-mouthing you. If not, you’re history. (Guess we all know where that’s going)! 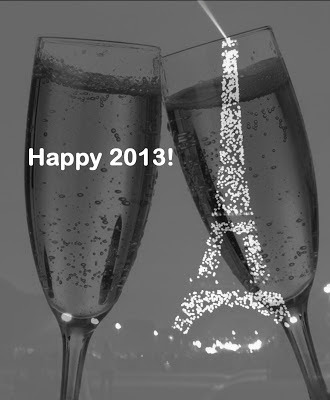 May 2013 be filled with love, happiness, good health, prosperity, art, music and literature. And sports if you like them. If I’ve left anything out that you want, I hope you have it too!